Darwinia plants and species such as Darwinia macrostegia make an outstanding garden plant given appropriate conditions. We recommend looking for the grafted varieties of D. macrostegia and other grafted species as they seem less susceptible to disease. Those grafted onto Darwinia citriodora rootstock seem to be the hardiest of all. A group of approximately 20 species found in Western Australia. From 1 -1.5m. In the past Darwinia have proved to be somewhat temperamental in the home garden, however with grafted varieties now available such as Darwinia macrostegia or Mondurup Bell along with Darwinia lejostyla they now have a place in the home garden. Full sun to semi shade, a well drained soil and lots of mulch to keep the roots cool. Bell shaped flowers and a long flowering season from spring through to summer make Darwinia a most attractive addition to the rock garden and can be a great feature when grown in a pot. Darwinia citriodora is known as Lemon Scented Myrtle. Darwinia macrostegia, or Mondurup Bell is originally from Western Australia and to grow these successfully away from the natural environment it is best to look for grafted forms. With very attractive flowers that last for nearly 3 months this is a plant that will eventually reach 1m by 1m in ideal conditions. Flowers begin to form in autumn and reach full size in spring. We grow ours in a large pot on a north facing verandah, lots of sun. The large pot provides a cool root run and after it finishes flowering we move ours to a cooler position. Try not to over water or over feed. Darwinia macrostegia can be pruned lightly after flowering to maintain shape if required. If you are growing these in the garden remember that drainage is important, Darwinia do not like wet feet, even the grafted forms. And provide good airflow as they do not like high humidity. A light mulch around the plant will help retain a little moisture and maintain the preferred cool root run. When container grown, after 4 – 5 years you may find the plant dies suddenly, usually due to the potting soil collapsing and retaining to much water. 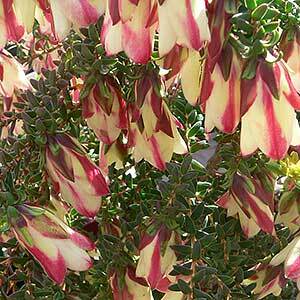 However you can buy another one, and it is worth the effort as when in full flower, this is magnificent plant. Flowering time – Winter to early summer. Height – To around 1 metre.